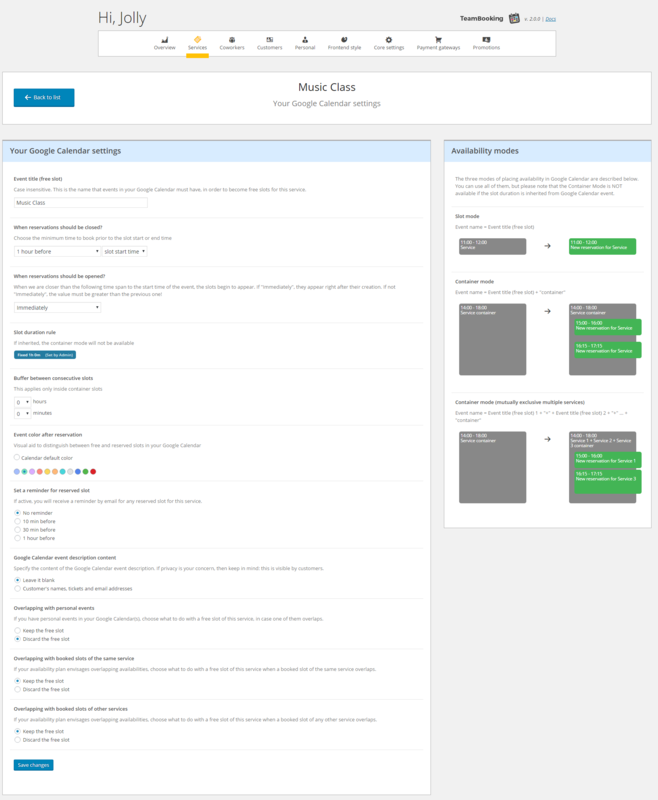 Team Booking is a WordPress booking and reservation plugin for appointments and services with a very distinctive feature: all the availability plans are made via Google Calendar! Once booked, the relative Google Calendar event will be updated! Why “team”? Because availability plans can be made by multiple “coworkers”! Collaborative – specify WP roles allowed to be service providers. They can work together for the same service, while keeping their own Google Calendars for availability planning! Customizable – tweak general and personal reservation behaviour, frontend calendar style, maps, confirmation email and more. 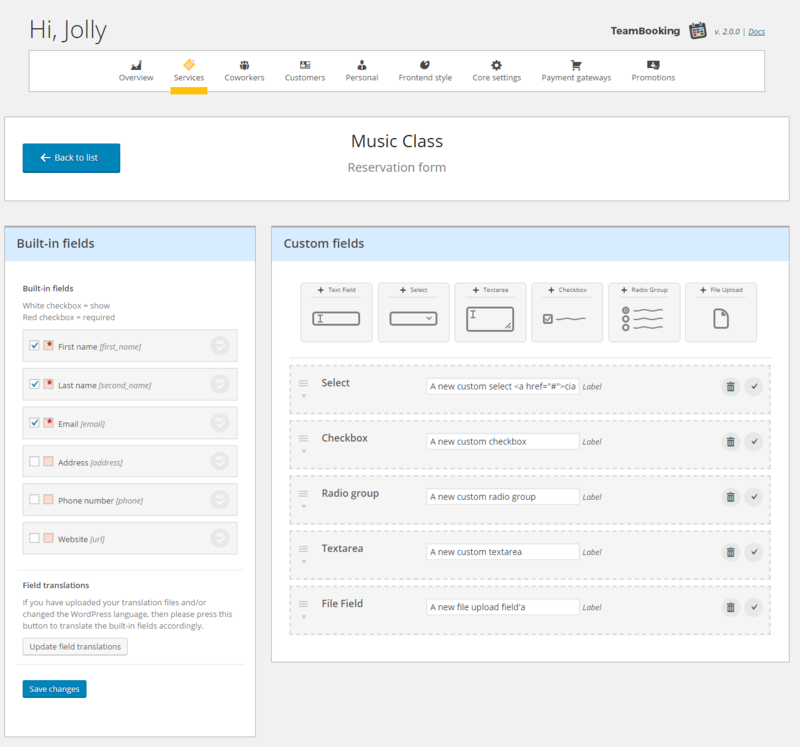 Hassle-free – the frontend booking calendar works out of the box with shortcodes! Timezone conversion – let the customers choose their timezones! Reservation form builder – create your perfect reservation forms! Payments – with PayPal and Stripe! Promotions – discount coupons and campaigns! Is a connection with Google Calendar required? In order to provide availability for scheduled services, a service provider must do that via Google Calendar. Unscheduled services don’t require a Google Calendar. A customer is not required to have a Google Calendar to book a service. Can I place repeating or full-day slots? Yes. All these Google Calendar possibilities are perfectly matched by Team Booking! Repeating slots in Google Calendar will help you with repeating availabilities, so you don’t have to create every single slot manually! Can I place multiple-days events? Multiple-days events (i.e. a single event from April 4th to April 6th) are not yet supported. Can I place a slot without showing the ending time? Yes! But please note that the slot will still have a duration, even if not displayed, that the customer can’t change. Can I place different frontend calendars by coworker or service? Yes. Not only, you can also mix them up as you prefer, via shortcodes. Can I choose not to show the calendar to unregistered users? Yes. You can either choose to show the calendar in read-only mode for unlogged users. Will the unregistered users be invited to register? Yes. The registration landing page is the WP default one, or you can choose any link to a custom registration page. Need customers a Google account? To set availability, there is no other way than using Google Calendar(s)? No, this plugin is made for that. Team booking is tested with WordPress 4.7+ and strictly requires PHP 5.3+. The plugin relies on Google Calendar and more generally on Google API infrastructure’s status to work properly. If you are going to use the PayPal gateway, then ensure your server being SHA256 and TLSv1.2 compliant, accordingly to the current PayPal standards. Please consider that the above requirements are not there as a joke. Using old PHP versions may expose you or your clients to security vulnerabilities and bugs that have been fixed in more recent versions of PHP. - Improvement: e-mail hooks start_datetime and end_datetime are splitted in date only and time only too, for a better customization. - Fix: "Error calling patch"
- Improvement: added a TinyMCE button for shortcodes! - Fix: "error calling GET: not found"
- Feature: multiple services container mode! - Feature: custom validation rules for reservation form text fields! 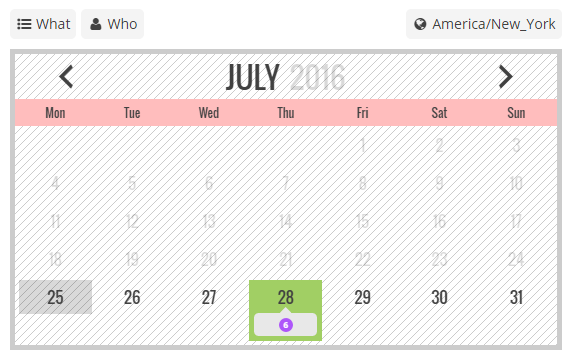 - Improvement: way faster frontend calendar when navigating through days. - Improvement: now also the "Event" class service reservations can be cancelled (revoked)! - Improvement: the coworker's auth process and the Google Calendars selection was simplified a lot, less room for user errors! - Improvement: backend overview tab, reservations can be sorted by "Date of reservation" or by "when" value. - Fixes: a lot of bug fixes. - Fix: cancellation now correctly resets the event color! - Improvement: a complete admin restyle! 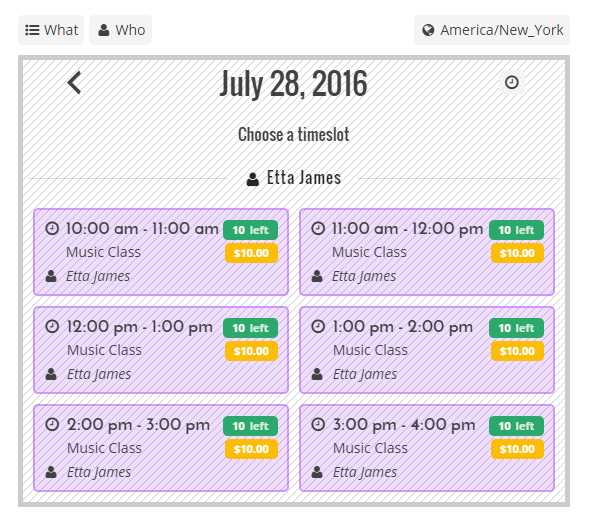 - Feature: multiple Google Calendars per Coworker! - Improvement: more values added to "when reservations should close"
- Improvement: minimum time for "when reservation should close" can be now relative to the slot's end time too. - Feature: location and maps! - Cosmetic tweak: frontend ticket selection now is made with a less fancy select. - Feature: added a new "container mode" for placing availability. - Feature: reservations can now be cancelled (revoked) by admins (Appointments only). - Improvement: it's possible now to manually book/un-book a slot on Google Calendar by changing the title (Appointments only). - Major changes in Timezone handlings. - Improvement: custom selects can now be "required"
- Feature: payments with PayPal! - Improvement: more buffer values for "when reservations should close"
- Feature: frontend service filtering ability! - Added: reservation form builder with custom fields (text, textarea, checkbox, radio, select)! - Added: new specific coworker's shortcodes! 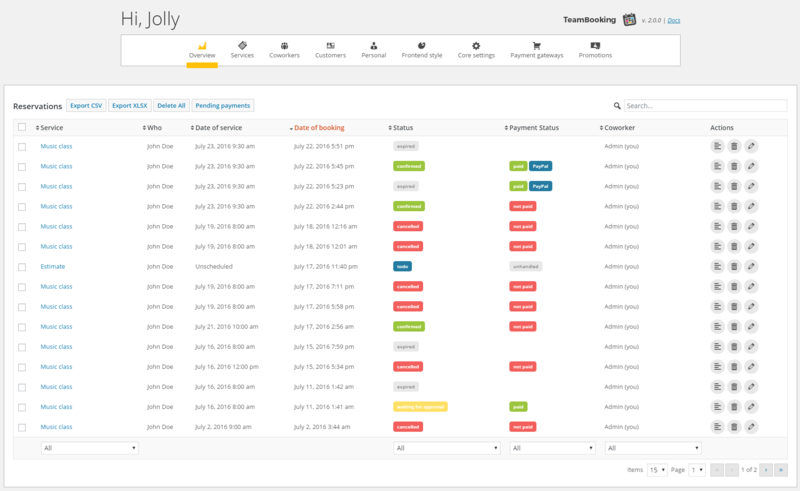 - Improved: way better ticket management for 'Event' services! 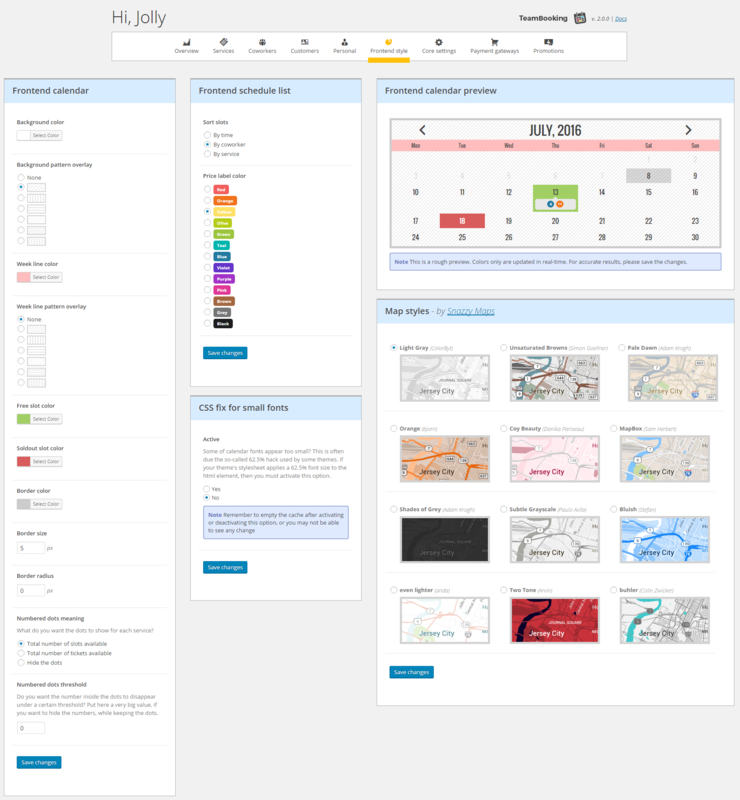 - Improved: improved calendar graphic customization in Administrator panel, with preview! - Added: more values and better logic for "when reservations should close"